Red Pine Mountain rises around the landscape west of Vernon as seen from the approach to the Vernon Hills. 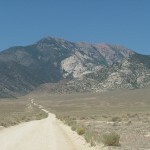 At the south end of Rush Valley there is a compact little range of mountains known as the Vernon Hills. At first glance they may seem unremarkable, but there are interesting features about this area if you take a closer look. The Utah Geological Survey defines wonderstone as a “wielded-vitric tuff (vitric means glassy) of rhyolitic composition.” Basically, these are rocks that contained volcanic glass particles, and by heat and compression, have been stuck together. They are beautifully colored in swirled maroon and yellow patterns, almost psychedelic in nature. The colors, according to the UGS, are caused by iron oxides. I have always been interested in rock hounding. Wherever I go, if it’s legal, I try to find a cool rock to add to my collection. Much to the chagrin of my wife, there are rocks everywhere in our yard — but I digress. To get to the Vernon Hills, take SR-36 south from Tooele City for approximately 33 miles. If you need a snack, stop at the Silver Sage Cafe and then continue through town. The road will bend in an arc to the east and you will pass between some low mountains. The mountains on your left are the Vernon Hills. About 3.2 miles beyond Vernon on SR-36 you will come to a railroad crossing. Before crossing the tracks, turn left onto a dirt road. To find the best areas for collecting wonderstone, continue on this road heading north for about 1.5 miles. Make sure you don’t collect any rocks on private lands or private claims, which should be clearly marked. The land in this area is mainly owned by the Bureau of Land Management, so contact the BLM for more information. You can collect wonderstone all over the surface of the Vernon Hills as long as you stay out of obviously worked claims and private property. Wonderstones are striking in appearance and make a nice addition to a rock collection. 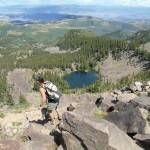 This is a great outing for children because the terrain is relatively easy to hike and some of the rocks are beautiful; you really get that “Aha! I’ve found something” feeling when you find a good wonderstone. Caution: If the roads in any portion of the Vernon Hills get wet, they turn into slippery, sticky, clay mud, so watch out. I went to the Vernon Hills a few weeks ago to look for wonderstone. I made a terrible error because I thought it had been cold enough overnight to freeze the ground. That was not the case. I went to the railroad crossing on SR-36 and headed north on the dirt road. It was fine at first, but as I neared the mountains, my truck fishtailed as if I were on ice. I stopped and discovered that all four tires were caked with clay mud several inches thick. It took me over an hour to extricate my truck. I was disappointed that I coated it with nasty muck and didn’t get to search for wonderstones — but I was thankful for making it back to the pavement. Forced to change plans, I decided to instead climb the highest point of the hills on the southern ridge. From the railroad crossing, I went back toward Vernon on SR-36 and then turned onto a well-defined dirt road that heads north toward the base of the hills. This road was in bad shape too, so I parked my truck and grabbed my backpack. I had to hike a mile before I reached the base of the hills, but the distance went quickly as I enjoyed the scenery. 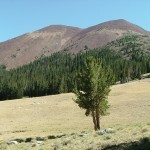 As you reach the base of the hills, the sagebrush gives way to juniper trees. As you gain elevation, the views of the Sheeprock Mountains — Dutch Peak to the south and Red Pine Mountain to the west — are beautiful. The Sheeprocks are mostly free of forestation, and when they are completely snow-covered, they make for an incredible high-desert scene. I marked a red bank on the first hill I approached and hoped I would find some wonderstone. But it was only a bunch of red rocks, so I crested the hill, descended its backside through junipers into a minor canyon, and headed north toward the highest peak. The temperature was about 31 degrees and all the trees and bushes were frocked with snow on their west sides. There were many things to see here: large-lobed prickly pear cactus, bouquets of hedgehog cactus, multicolored lichens, fuzzy green mosses and powder blue berries on the dark green junipers. As I walked, I had a pair of singing blue mountain jays for company. 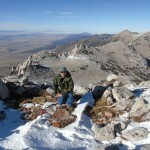 At the head of the small canyon, I ascended a steep rounded ridge connected to the summit and when I topped out on its crest, I had a good view of Deseret Peak. The view from the summit was spectacular. 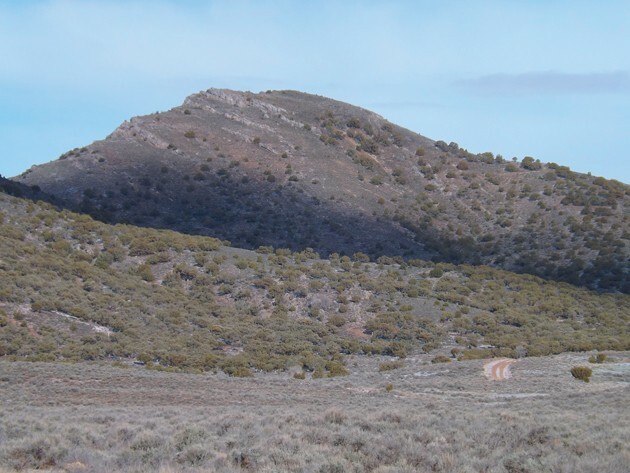 While exploring, I noticed a valley between the south and east ridges with junipers and a rocky outcrop near a dirt road that would make an excellent campsite. It started to snow and get windy, so I headed down the mountain. As I walked, I found a beautiful specimen of wonderstone with swirls of red pink and mustard. I took a picture of it and decided to leave it for the next person to enjoy. Total distance of this hike from the flat was 3 miles round trip and about 700 feet of elevation gain. The only drawbacks are the muddy roads and excessive littering in the area. For further information, visit the Utah Geological Survey Website at www.geology.utah.gov/popular/places-to-go/rock-mineral-collecting-sites/the-rockhounder-wonderstone-in-the-vernon-hills-tooele-county. For road conditions/property concerns, contact the BLM Salt Lake Field Office at 801-977-4300. Maps: Vernon; Lofgreen; Vernon NE and Faust USGS 1:24000 Quads.